This shirt. I almost left without buying this shirt. Obviously I would have been a crazy person, since it IS my new favorite shirt! Two things: don't forget to sign up for the Blowfish giveaway if you haven't already, and I'm now accepting sponsors for the month of August. If you have any questions, feel free to email! The tights are lovely as well, super cute! That top and those tights are BEAUTIFUL!!! Cute outfit! I love that little barrette. Those always remind me of when I was a kid. I wish I still had mine! I wanted those shoes so bad...btu I think they are sold out. I got he Gimmicks in brown in a 10...hopefully with my wide feet they'll fit! This is so sweet. I love the little detail! That's an adorable shirt! I love high-waisted skirts and shirt tops, such a cute look. This outfit is gorgeous! 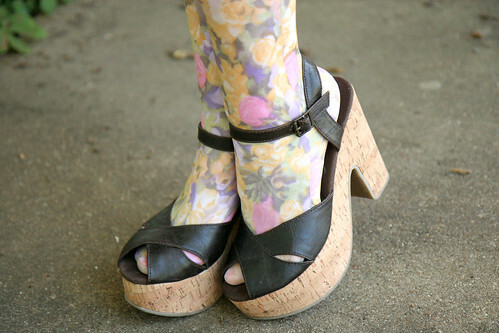 I am loving those floral tights and shoes:) You always look pretty, but you DO look extra-pretty in this outfit! Beautiful outfit! I am in love with your shoes, they're so perfect. I love how I'm not the only one who scores in the kid's section! LOVE the skirt too! Target kids section?!?! Never thought to look there. Sooo cute! :) I have the same skirt!! I love Target's kids skirts & sometimes I can even wear the dresses too! Hope may love pink, but I think she even loves her mom more... How cute is it, to always tell you how pretty you are?! I mean, you are... so I think she ha an easy job with it :)! this outfit is adorable! i love the tights! they're subtle yet pretty. and that top! gosh. great job! adorable. i have those same two brooches from her, love them! Katie :) you are so darling pretty! Definitely one of my biggest role models. I adore your style & passions! I wore my brooch yesterday too! <3 I love yours! The crane is beautiful! That shirt is super cute and I love your little hair clip. I have some of those too and they always remind me of being a little girl. very pretty outfit looking so cute..
you look so adorable!!! i looove that shirt on you! and i'm so happy you wear pink! [my mom has red hair and she always refused to wear pink because she thinks pink and red don't "go". but i pink and red are one of my favorites!] anyway! looove your outfit! Yep, I definitely like you in pink. And those tights are ADORABLE. That shirt is seriously adorable. What a great outfit! You look BEAUTIFUL. I think pink may be your color! I'm loving your accessories! They are so unique. Where do you get them? I love your blog, and what a cute outfit.